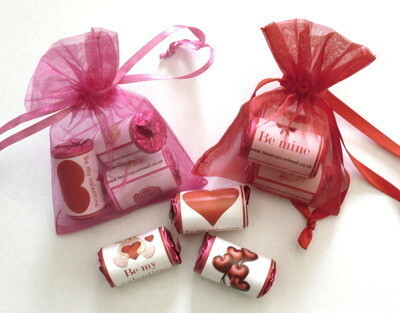 Mini rolls of love hearts (7 sweets) with your own personalised outer wrapper in a red or hot pink organza gift bag. Choice of 2 or 3 mini rolls of love hearts in each bag. Please choose from the drop down menu which of our valentine designs you would like on your personalised wrapper. We can also add "Be my valentine" or "Be Mine" to the wrapper design or if you prefer you can add your own short message. Please type in the freetext box below the message you would like us to add to the wrapper. Please choose whether you would like a hot pink or red organza bag and whether you would like 2 or 3 rolls inside your bag. The price will be adjusted automatically. Also available mini choc and mixed organza gift bags.